It didn’t come from where we expected, but it came hard and strong. What did ? A moment of truth. 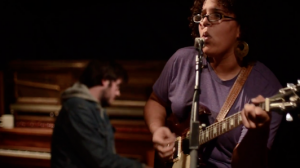 And this moment came from the band Alabama Shakes who has released Hold on, single to their debut album Boys & Girls. Diving into the old blues traditions mixed with a feel of modern pop, it is by following lead singer Brittany Howard that we fall into something raw, simple and true. So get on board and press play !